Located in St. Louis City real estate, homes for sale in Tower Grove MO are conveniently located near the vibrant South Grand business district. Tower Grove Real Estate and Tower Grove properties are a perfect addition to the St. Louis Real Estate market. Homes for sale in Tower Grove are conveniently located to all major highways. Tower Grove real estate is primarily made up of older historic homes. The Homes for sale in Tower Grove MO range in price from approximately $50,000 for gut rehab homes to $500,000. The median home price in 2014 was approximately $210,000. These homes are known for their solid construction and unique stone fronts. Residents of Tower Grove enjoy Tower Grove Park. This 289 acre park provides fun for everyone in the family. There are 11 Pavilions mostly dating from the Victorian Era and many feature their original historic design. The park is also known for its bird watching seasons in the spring and fall. They offer a wide variety of activities including Yoga, horse shoe pits, tennis, running paths, carriage rides, ball fields, playgrounds and senior programs. The Tower Grove residents are served by the St. Louis City School District including Roosevelt Senior High. See Great Schools for up to date ranking on every school in the area. The Tower Grove and Neighborhood Community Development Corporation provides additional information regarding the Tower Grove area and upcoming events. If you are looking for a home for sale in Tower Grove MO or you would be interested in buying a home in Tower Grove, please contact St Louis County real estate expert, Sharon Colona and St. Louis Realty for a professional and simple buying or selling process. Call (636) 397-7653 or email at scolona@stlouisrealty.net. A beautiful, spacious full renovation inside and out. This newly reconfigured 2,450 square foot home with an open floor plan is just 4 blocks from Tower Grove Park and 2 blocks from a variety of restaurant options on S. Grand. Beautifully refinished hardwood floors and some exposed brick walls take a backseat to the new kitchen with granite countertops, new stainless steel appliances including gas range/oven, island with a separate sink and cutting board, walk-in pantry and a built-in microwave. xD; xA; xD; xA;Each of the 3 second floor bedrooms has a walk-in closet and the master suite has a beautiful stand- alone shower with a sealed exposed brick wall, a separate bath tub and a double vanity. The master also has a brand new walk-out deck which stands above the new deck on the first floor. The 2 car garage has new siding, windows and a new roof, a great amenity in the city. xD; xA; xD; xA;The master craftsmanship of the improvements are truly impressive. Showings start immediately, come see it today! One of a kind opportunity across the street from Carondelet Park! This impressive well maintained brick & stone 2 story home in the desirable Holly Hills neighborhood offers 3132 sq ft of living space & 3 full baths and 1 half bath. There are 3 full bathrooms upstairs to serve the 3 bedrooms. All bedrooms have hardwoods under the carpet. Half bath on main level. Great details like stain glass windows, terrazzo floors, and a detached two car garage! OPEN Saturday 4/20 12-2 pm! Located in the Tower Grove Heights National Historic District on a beautiful tree-lined street, this completely renovated home is the perfect blend of vintage charm & modern design. From the moment you step in, you'll love this home's comfortable & elegant feel. Original restored hardwood flooring, pocket doors, & period millwork are just a few of the charming elements that make this home special. The 1st floor features a lovely entry foyer, living room w/ gas fireplace, formal dining room, bright & cheery kitchen that opens to a breakfast room/family room, & a half bath. Upstairs is a luxurious master suite w/ balcony, 2 additional bedrooms, full hall bath, & a large open area that serves as an office/sitting area. The large deck w/ wood-burning fireplace offers a relaxing spot to entertain friends & family. A fenced yard w/ 2-car garage completes this urban gem! Within walking distance to amazing restaurants, unique shopping & Tower Grove Park. 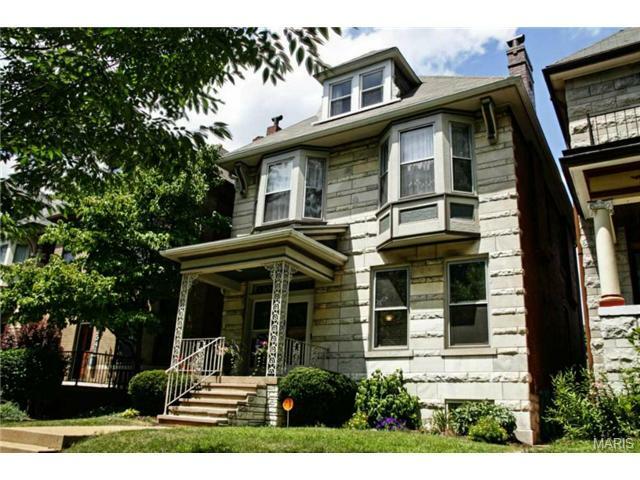 Welcome home, w/ a very spacious 2.5 finished levels, 3500+ sq feet of living area in historic Tower Grove Heights! Walk through the front door to 10 foot soaring ceilings & wood floors on the main level and beyond. Charming features in this lovely, large brick home include 3 decorative fireplaces & original stained glass. Enjoy a fresh updated look to the large kitchen w/ ample storage all centered around an oversized island & newer appliances. 5+ bedrooms/4 full baths, + 2 additional bonus rooms prefect for hobbies/home office. The master bedroom boasts a spacious bath w/ dual shower heads & double sinks. Best of all, the 3rd floor offers an additional master bedroom opportunity w/ full bath attached. The fully fenced yard leads to the 2 car garage w/ a 3rd covered bay & makes this very spacious home ready for city living at its finest. Restaurants are within easy walking distance as well as parks & local events. Schedule today to view this well maintained & move in ready home! Completely renovated and modernized, this duplex converted to a single family home offers that extra living space you crave in a Tower Grove listing: Authentic barn wood-wrapped beams define the living, dining, family room, and kitchen in this open floor plan. Thoughtfully designed kitchen offers beautiful quartz counter tops and shaker cabinetry along with ceramic tile. Upstairs you will find 4 bedrooms plus a bonus area for an office or play space! Every detail was meticulously thought out. Gorgeous hardwood floors, mill work that adds so much character and new windows let in so much natural light! The location is ideal for the modern urban lifestyle..have breakfast every morning at The London Tea Room and do all your grocery shopping at the Local Harvest Grocery store, both located just steps from your door! One short block away from beautiful Tower Grove park...the perfect place to take a run, walk your dogs, or ride your bikes. This is city living at it's finest! Phenomenal complete remodel with high end finishes! Spacious 4 bedrooms, 2.5 bath home with a huge living/dining combo, over 10' ceilings downstairs. Eat-in kitchen has high end, stainless steel appliances with plenty of storage from the stacked cabinets and plenty of granite counter space. Gorgeous hardwood floors throughout! The first floor master is incredible with tons of light and french doors. Master bath has beautiful finishes and a great sized walk-in shower. Three bedrooms greet you upstairs with closet space galore. All new windows, a full basement & highly coveted two car garage!! Convenient to grocery stores, restaurants like The King and I, Tower Grove Creamery, Rooster and Hot Box cookies and SO MANY MORE! You cannot miss this amazing home! !